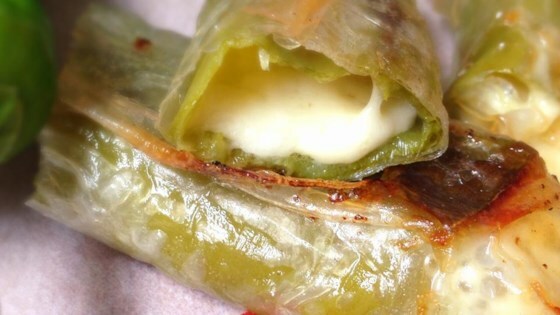 "These are like individual chile rellenos. Serve with salsa and or guacamole." Heat 1/2 inch of oil in a large skillet, or preheat a deep-fryer to 350 degrees F (175 degrees C). Insert a piece of cheese into each chile. Place a stuffed chile diagonally across the egg roll wrapper. Moisten all four sides of the wrapper with water. Fold the sides in and gently press to seal the ends. Starting at the bottom fold the point up and gently press around the chili. Roll up and seal the edges. Fry the rolls in the hot oil until golden brown on all sides, about 3 minutes. When the first side in nice and brown gently flip over and brown the other side. Work in small batches so the egg rolls don't touch while frying. Remove from the oil to drain on paper towels. Serve warm. It is important to not puncture the wrappers prior to or during frying or the filling will leak. Won't bother making them again. These were sooooo good! I couldn't find wonton wrappers so ended up making them. I baked them in a 350 oven until golden. YUM!! Thanks Baking Nana! Perfect as written. Might also be good with Velveta cheese. Husband ate them up!!! We will make these again soon.